When you are truly Out Of Options...this is the knife to reach for. Not many of us have the time to become knife-fighting experts--and unless you really are an expert, you'll fumble that folder when confronted with a deadly threat at knife range. That's just what adreneline does. 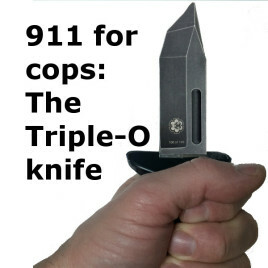 This knife was designed from scratch to be easily used in the kind of desperate situation that calls for a knife--beaten, bruised, deprived of your sidearm, and unable to escape. Maximum effectiveness even with minimal training. For LEOs, private security, and anyone who has ever thought "what if?" Add a belt clip for just $6 more: a coupon will appear in your shopping cart, be sure to click on it! Blunt trainers are also available--save $10 when you buy the pair. Please check your local laws! Knife control can be as irrational and surprising as gun control.